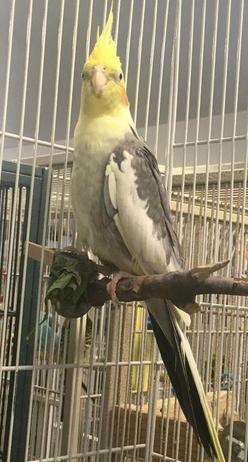 Email BurgeBirdRescue@yahoo.com for an adoption application, or call us at 816-356-4700 for an appointment to see our birds. 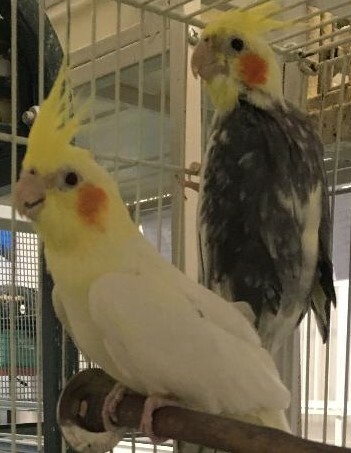 Yoshi and her friend Pip live in the same cage together at Burge Bird Rescue. 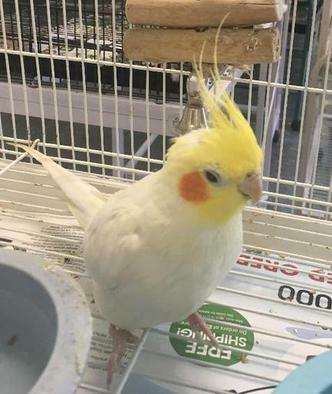 Yoshi is a six year old pearl cockatiel. Pip is also about six years old. 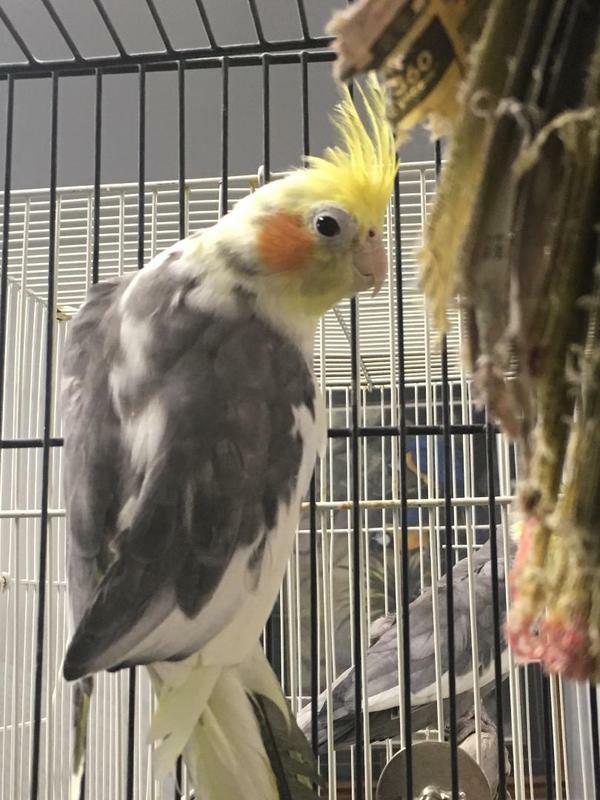 Pip is a pied cockatiel. They are both fairly shy, so it will take some time for them to get used to you. Pip and Yoshi will have to be adopted as a pair together. The adoption fee is $20. Pepper and Paulie are two, sixteen male cockatiels. They are not tame, but may warm up if worked with. They will both need to be adopted together. 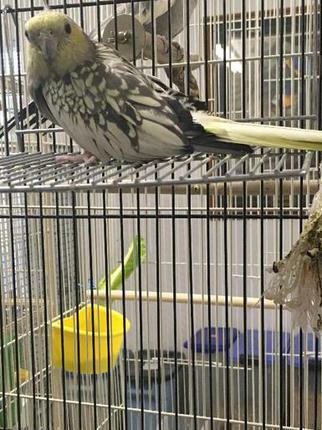 The adoption fee for each cockatiel is $20. Sparkles and Muscles are both four year old female cockatiels. Sparkles has pearl markings and Muscles has pied markings. They are both tame. These sisters are looking for a good home. They must be adopted together. The adoption fee is $30 each. 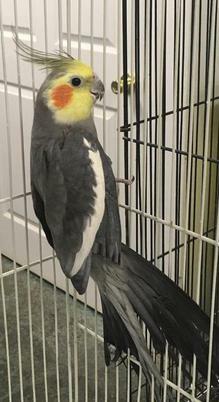 Ang is a four year old male, pied cockatiel. He lives in the same cage as his friend Katara. 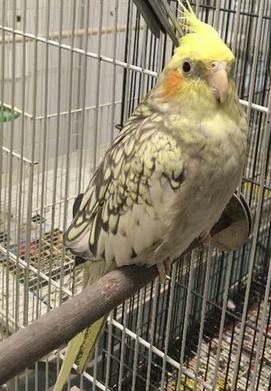 Katara is an adult lutino female cockatiel. They are both untame birds. They will needed to be adopted together as a pair. The adoption fee is $20 each. 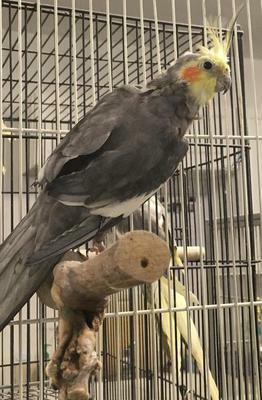 Piki is a ten year old Lutino, male cockatiel. He lives in the same cage as his friend Jewels. Jewels is Pearl grey cockatiel. She is about ten years old. 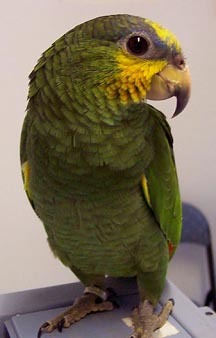 She has a partial disability with her wing, so she is unable to fly normally. Piki is blind in his right eye. He has some vision in his left eye. He and Jewels will need to be adopted together. They are somewhat tame. They will need someone that can have patience with them. Their adoption fee is $25 each.